When it comes to finding the best cleaning services to keep their facilities spotless, many property managers stress over the cost of hiring on such services. The total cost for effective janitorial cleaning services can be an intimidating figure, which is one reason why many managers aim to cut corners first and consider ramifications later. As a quality provider of janitorial services to Boston, Braintree, and beyond, Super Serv is here with the goal of exceeding our customer’s’ expectations while optimizing operations and minimizing costs. Today, we’ll conclude last week’s blog by focusing on a few more areas in which our cleaning company can optimize your facility with optimal janitorial services while reducing costs in the process. Doing so can create long-term benefits for your company as well as your yearly review! While some cleaning companies put little thought into the costs of water and electricity associated with sanitizing your facility, our industry experts are here to optimize efficiency in every way we can. By working in a precise and effective manner, Super Serv is able to minimize the facility costs to you for our janitorial services. Having the right tools for the job can create major money-saving opportunities when it comes to cost efficiency. Our top-notch tools are also the best in the business, reducing the time it takes to get the job done. When our expert janitors save time on each cleaning service, it’s you as the customer who benefits from the savings! While not directly connected to your facility, the overall quality and retention of our top cleaning specialists does help you save. Super Serv has focused on employee retention and training to ensure that our high-quality team is fully stocked and ready to work. Unfortunately, the nature of the cleaning business consists of high turnover rates and decreased staff quality levels. What this means for you as the consumer is that these cleaning companies are constantly in a state of hiring and retraining new personnel, which can add up to be a costly method of doing business. In order to stay profitable, most cleaning companies push this higher expense onto you as the customer, creating a cost that is higher than what you would consider fair. Super Serv’s high retention rate and optimal training measures ensure that your company is receiving the best product at an amazing price. While increased quality often equates to higher prices, our innovative approach helps to make the costs much more acceptable. Additional cleaning costs. Going back and performing janitorial services again equate to higher costs for your facility. Many cleaners are based on hourly rates, and when something needs to be done, the structure entity is often the one to bear the financial cost. A worse scenario may develop if your janitorial company applies the wrong agent or does not pick it up correctly,. The costs to clean up these initial mistakes can be even higher than your original charge! Safety concerns. 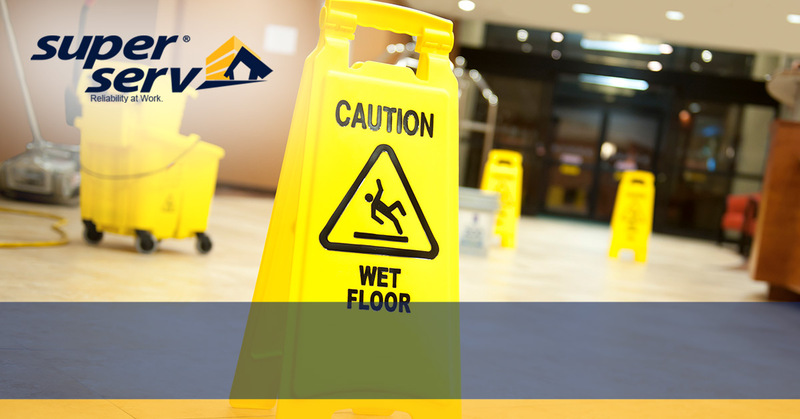 Wet, slippery floors and surfaces can provide ample opportunity for employees and guests to harm themselves. It’s essential to perform all cleaning tasks according to plan to minimize the chances of something quirky occurring. When your facility isn’t safe, it can reflect poorly on you or your organization. Higher operating costs. Whether through insurance or Worker’s Comp, your cleaning company may be facing high costs to cover their present and previous indiscretions. Hiring a company with a sterling record can prove to be an affordable move when compared to hiring a subpar group of cleaners with several marks on their record. More downtime. Any cleaning services that need to be done during operating hours can hamper your bottom line. It’s essential to find a company that excels in cleaning effectiveness in order to minimize the costs of your facility downtime. While numerous cleaning companies out there are aiming to make a quick buck, Super Serv is here to provide you with a lifetime of service. It’s in our best interest to streamline your operations and costs, as the money saved can go toward our Boston janitorial services. Our top-notch staff is in this industry for the long haul, supplying Massachusetts businesses with long-term solutions that aim to save you big over the years. Nearly any American with a vacuum and a van can break into the industry, offering cleaning services that sound too good to be true. Super Serv, on the other hand, is here to set the standard for how a cleaning company should act. If you are in need of unbeatable janitorial services in the Boston area, be sure to reach out to Super Serv to learn more. Our personnel is here and ready to be your one-stop shop for any and all facility needs. By acting as a lone contact, our project managers are able to provide fast, efficient cleaning solutions for anything that may come up in your daily operations. Contact us today to learn more or to receive or instant quote!